The World Car Awards (WCA) is an association of 48 international automotive journalists from all over the world. As a not-for-profit association administered under the guidance of distinguished automotive journalists from Asia, Europe, and North America, WCA draws on the experience and expertise already developed by award programs throughout the world. 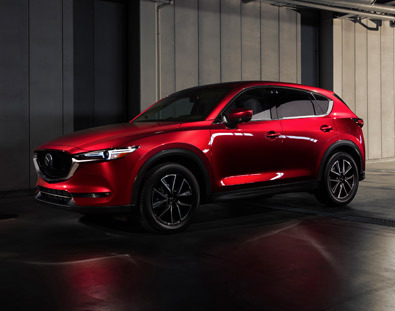 The 2018 Mazda CX‑5 comes with cutting-edge technology, like G‑Vectoring Control, improving responsiveness as well as achieving a reduction in Noise, Vibration and Harshness (NVH), and i‑ACTIVSENSE safety technology. As the first Mazda built from the ground up with our groundbreaking SKYACTIV TECHNOLOGY, the CX‑5 has been fine-tuned since its launch, delivering even better responsiveness and control for an exceptional Jinba Ittai – the feeling of oneness between driver and vehicle. Enhanced interior features and the evolution of our KODO design philosophy inside and out, the CX‑5 is practical, technologically spectacular and beautiful to behold. All helping to make the CX‑5 a joy to drive and every drive a great drive. At the heart of every idea, concept and realization of a Mazda vehicle is our engineers’ and designers’ passion for driving – for that connected-to-the-road feeling that creates anticipation for the road ahead while keeping drivers fully engaged both tactically and emotionally. Thank you World Car Awards!